Saint Lucy (283–304), also known as Saint Lucia, was a wealthy young Christian martyr who is venerated as a saint by Roman Catholic, Anglican, Lutheran, and Orthodox Christians. Her feast day in the West is 13 December; with a name derived from lux, lucis "light", she is the patron saint of those who are blind. Saint Lucy is one of the very few saints celebrated by members of the Lutheran Church among the Scandinavian peoples, who take part in Saint Lucy's Day celebrations that retain many elements of Germanic paganism. Saint Lucy is one of seven women, aside from the Blessed Virgin Mary, commemorated by name in the Canon of the Mass. Hagiography tells us that Lucy was a Christian during the Diocletian persecution. She consecrated her virginity to God,refused to marry a pagan, and had her dowry distributed to the poor. Her would-be husband denounced her as a Christian to the governor of Syracuse, Sicily. Miraculously unable to move her or burn her, the guards took out her eyes with a fork. In another version, Lucy's would-be husband admired her eyes, so she tore them out and gave them to him, saying, "Now let me live to God".The oldest record of her story comes from the fifth-century accounts of saints' lives. By the 6th century, her story was widespread, so that she appears in the Sacramentary of Pope Gregory I. At the opening of the 8th century Aldhelm included a brief account of her life among the virgins praised in De laude virginitatis, and in the following century the Venerable Bede included her in his Martyrology. In medieval accounts, Saint Lucy's eyes are gouged out prior to her execution. In art, her eyes sometimes appear on a tray that she is holding. Until 1861 relics of Saint Lucy were venerated in a church dedicated to her in Venice; after its demolition, they were transferred to the church of San Geremia. Her history is interesting but obviously full of legends as well, so I trather concentrate on the Relics. 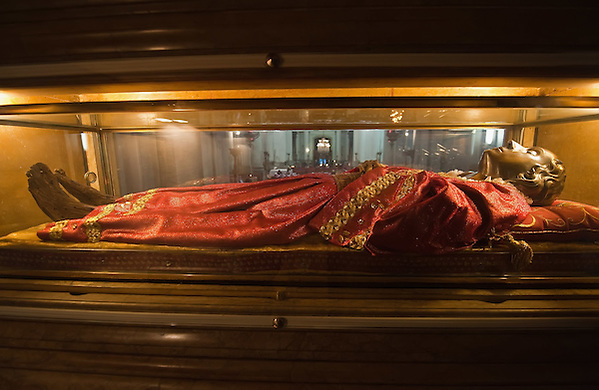 Sigebert (1030–1112), a monk of Gembloux, in his sermo de Sancta Lucia, chronicled that her body lay undisturbed in Sicily for 400 years, before Faroald II, Duke of Spoleto, captured the island and transferred the body to Corfinium in the Abruzzo, Italy. From there it was removed by the Emperor Otho I in 972 to Metz and deposited in the church of St. Vincent. It was from this shrine that an arm of the saint was taken to the monastery of Luitburg in the Diocese of Speyer - an incident celebrated by Sigebert himself in verse. The subsequent history of the relics is not clear. On their capture of Constantinople in 1204, the French found some relics attributed to Saint Lucy in the city, and Enrico Dandolo, Doge of Venice, secured them for the monastery of St. George at Venice. In 1513 the Venetians presented to Louis XII of France the saint's head, which he deposited in the cathedral church of Bourges. Another account, however, states that the head was brought to Bourges from Rome where it had been transferred during the time when the relics rested in Corfinium. The remainder of the relics remain in Venice: they were transferred to the church of San Geremia when the church of Santa Lucia was demolished in the 19th century to make way for the new railway terminus. A century later, on 7 November 1981, thieves stole all her bones, except her head. Police recovered them five weeks later, on her feast day. Other parts of the corpse have found their way to Rome, Naples, Verona, Lisbon, Milan, as well as Germany and France.